I do not dismiss them because they belong to a certain political group. I dismiss them because I have seen them lie and distort repeatedly, and never be right about anything, and never retract allegations, and never admit or correct mistakes. Lüdeke concludes that there is no trend in the global temperature record of the past century or so, after he removed the trend by So far so good. Unfortunately, fluctuation analysis does not work on trending variables. Therefore, LLE use DETRENDED fluctuation analysis. That is, they first fit a polynomial of order two to the data, remove this trend, and study the deviations from the trend. Having removed the trend from their data, LLE cannot answer the question: What caused the warming? They eliminated from their analysis the very thing in which they are interested. This trick, of course is one of Tamino's top ten on this list of statistical flim flam but there is a lot more. From basic physical assumptions we derive a simple linear model of the global CO2 cycle without free parameters. It yields excellent agreement with the observations reported by the carbon dioxide information analysis center (CDIAC) as time series of atmospheric CO2 growth, of sinks in the ocean and of absorption by the biosphere. The agreement extends from the year 1850 until present (2013). Based on anthropogenic CO2 ; emission scenarios until 2150, future atmospheric CO2 concentrations are calculated. As the model shows, and depending on the emission scenario, the airborne fraction of CO2 begins to decrease in the year ∼ 2050 and becomes negative at the latest in ∼ 2130. At the same time the concentration of the atmospheric CO2 will reach a maximum between ∼ 500 and ∼ 900 ppm. As a consequence, increasing anthropogenic CO2 emissions will make the ocean and the biosphere the main reservoirs of anthropogenic CO2 in the long run. Latest in about 150 years, anthropogenic CO2 emission will no longer increase the CO2 content of atmosphere. Weber et al attempt to model the interchange between the biosphere (b), the atmosphere (a) and the ocean (s). The grey line shows what everybunny else finds, the blue what the EIKE crew claims. To first approximation the three upper reservoirs their model treats each hold about the same amount of carbon. Fossil fuel combustion pushes carbon into the atmosphere, and that carbon is moved from the atmosphere into the biosphere and the surface ocean. And then there is physics and chemistry. 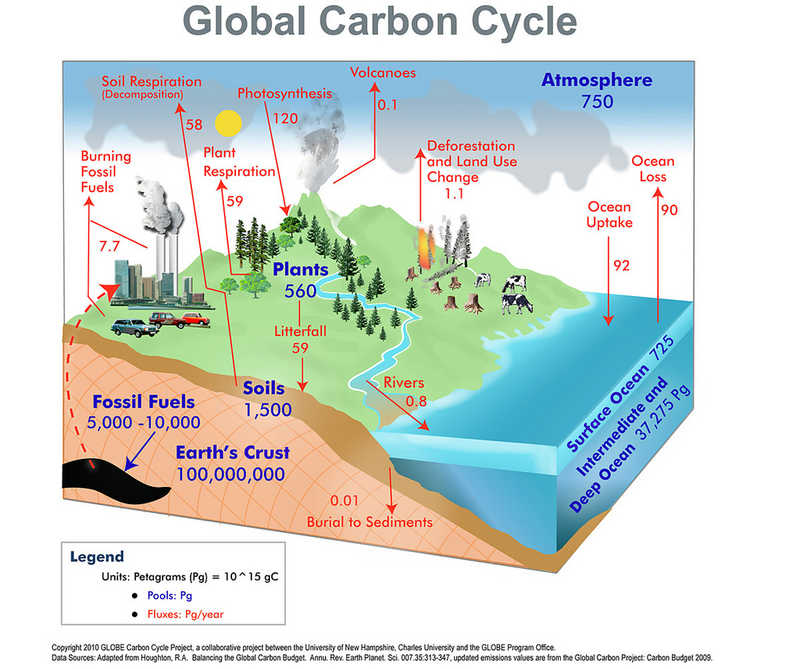 Even if one denies the analysis of the carbon cycle as shown above, if, as Weber, et al, claim, all of the excess carbon injected into the atmosphere is totally sequestered into biological materials after a hundred years or so, for it to stay there as required by their analysis would mean that decomposition of biological materials would not be increased by the increased amount of material. Similarly for excess CO2 sequestered in the surface oceans. If the partial pressure of CO2 in the surface ocean is increased physics requires that the out gassing of the surface ocean would be increased. Can transport processes within the ocean be approximated with a single time scale? There is the GLODAP data base on CDIAC which includes CFCs and radiocarbon data sampled over the pastdecades (Key et al., 2004). These data show that mixing time scales for the upper thermocline are decadal and mixing time scales for the deep ocean are multi-centennial. The lowest radiocarbon ratios of dissolved inorganic carbon are found in the deep Pacific with values that are about 240 permil or so lower than the atmosphere or about 200 permil lower compared to the surface ocean. This corresponds to a water age of roughly 1800 years. Eli's second name must surely be Thumper, given the 1-2 slugging that he's served here.
" after he removed the trend by So far so good. " The deepest waters of the world's oceans are deposited there due to the thermohaline circulation (THC). That's the reason those waters are very cold, at of below freezing. There are two regions at which the THC is found, around the Antarctic and in the high latitude North Atlantic, the Arctic Ocean and the Nordic seas. The sinking is associated with the growth of sea-ice, a process which results in the release of high salt content brine, which, when added to the surrounding water, makes that water dense enough to sink to the bottom. The rate of the sinking varies with season and on longer time scales. The sinking water also transports CO2 into the deepest layers of the oceans. Eli's discussion doesn't directly mention the THC process, which is expected to weaken in the Northern Hemisphere due to AGW. That's due to freshening of the surface layer at high latitudes, due to increased moisture transport from lower latitudes, more water from the glaciers of Greenland, and the export of low salinity water and sea-ice from the Arctic Ocean. As the THC weakens, the net effect may be a reduction in the rate of CO2 sequestration in the deep oceans as upwelling processes could be expected to continue bringing deep waters toward the surface, releasing CO2 as those cold waters warm up. Sometimes DOC in deep water makes deep water appear older in radiocarbon dating. Ironically, they cite my paper on the atmospheric residence time of CO2, but obviously didn't read the section on why such simple models are only useful for qualitative illustration of aspects of the carbon cycle, but cannot be used for meaningful quantative predictions. You know, I used to work gathering temperatures aboard a NOAA vessel (we Cuban refugees are Jack of all trades). I don't recall freezing or sub freezing temperatures near the sea floor anywhere we dropped our thermography zingies. I believe it was more like say 2 to 5 degrees C.
FL, to my way of thinking, 2C is close to freezing. According to this link, the Antarctic bottom water can exhibit a potential temperature below 0C in the Southern Oceans. HERE's a link to a graph. Maybe you weren't taking samples at a location with the coldest bottom waters. Fernando, it's called a CTD and I've seen frost form while taking oxygen from abyssal Niskins in the tropics.